Limor Sohn Har-Melekh, the widow (since remarried) of Shalom (Shuli) Har-Melekh who was murdered in 2003 at age 25, said Wednesday that she remains hopeful ten years later that she and others will return to their homes Homesh, one of four northern Samaria towns uprooted in the 2005 Disengagement plan. In an exclusive interview with Arutz Sheva, she said, "the goal is to undo the crime and build the places that were destroyed; we stand before the Creator of the Universe and ask that He look and see the yearning, the desire and the longing." Sohn Har-Melekh's first husband was shot to death by Arab terrorists with automatic weapons in an attack on the couple's car while they were driving northeast of Ramallah in Samaria. Limor, who was seven months' pregnant at the time, was moderately wounded and later the same day their daughter Sarah was born in an emergency caesarean section. Al-Aqsa Martyrs' Brigades, the "armed wing" of Palestinian Authority (PA) chairman Mahmoud Abbas's Fatah faction, which was then led by Yasser Arafat, claimed responsibility for the murder. Sohn Har-Melekh, who was a member of the original nucleus group that founded Homesh and Sa-Nur, was one of the organizers for a massive event attended by ministers and MKs on Tuesday at Sa-Nur, another of the northern Samaria towns evacuated by the government alongside Gush Katif in Gaza. "The nucleus group of Homesh today is mostly in Shavei Shomron, but our homes look out on Homesh and Sa-Nur, our heart is there," she said. "It's also clear to my children that the day Homesh is rebuilt we'll return to our home." 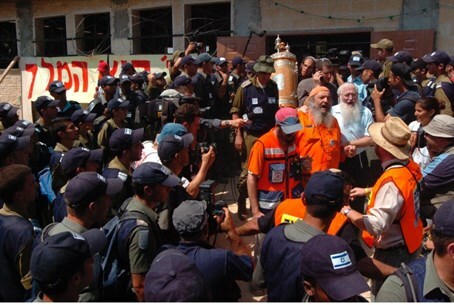 "Today there is a group of self-sacrificing youths and yeshiva students who go up to Homesh and make the voice of the Torah heard, and do not allow the foxes go there," the widow said, noting the efforts to prevent Arab squatters from occupying the town. "There was a crime here and an immoral act, and it must be fixed." Sohn Har-Melekh said even if the visit to Sa-Nur on Tuesday was only a one-time occurrence and not an actual return, she is undeterred. "I do what I believe in and I don't care what others say. We didn't give up on Homesh and Sa-Nur and we still haven't moved on to the next mission - the last word has yet to be said," she concluded. The attempts to return the Jewish residents to the towns they were forcefully expelled from have recently been expressed in a bill that aims to repeal the Disengagement.